Wendy’s is well-known for their sassy, saucy social media presence, but there was no sass necessary for this viral Twitter outbreak. Thanks to Carter Wilkerson, an average 16-year-old, Wendy’s is back in the spotlight. 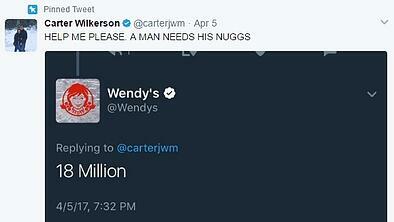 The hashtag, #NuggsForCarter has become an online phenomenon. 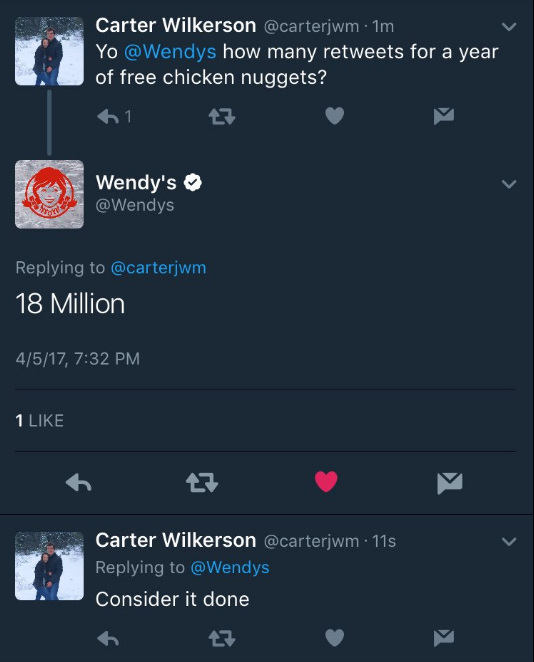 On April 5, Wilkerson tweeted “Yo @Wendys how many retweets for a year of free chicken nuggets?”, to which Wendy’s official Twitter account replied, “18 million”. “Consider it done”, he said. Since then, he has accumulated the largest retweet count ever—over 3.4 million—which narrowly beat out Ellen DeGeneres’ famous “Oscars selfie” tweet. Wilkerson’s tweet was dangerously close to that number when we first posted this blog, but now he's the new record holder! There’s even a website dedicated to the comparison. What other lessons can Wendy’s teach us about social listening? 1. People want responses that aren’t robotic. 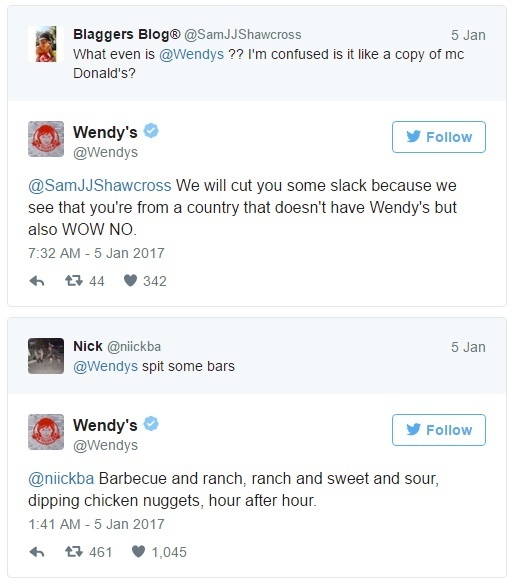 What makes Wendy’s Twitter presence so irresistible is the fact that they respond regularly and authentically. Instead of following the boring “Sorry to hear that – *phone number* – for more help” formula, Wendy’s takes time to personalize messages that are witty and fun. 2. You can create engagement and demand by encouraging fun. Through listening on their channels, Wendy’s also found out that they can make even their cheapest food sound cool. How? By encouraging their followers to tweet about their value-menu items, but with a catch: Followers named items in their own way (like calling their chicken nuggets, "fried yum"). The brand saw a spike in the number of value-item purchases after that. Coincidence? We think not. 3. Delivering on customers’ requests is much easier. By listening in on the Twitter-sphere, Wendy’s social media team found that people were wondering how they could eat out at Wendy’s without destroying their diet. In turn, Wendy’s created an interactive app with each menu item’s nutritional information. This has had millions of downloads since. That’s the power of listening. Check out our blog on social media marketing for more tips on listening and measuring responses. Social listening can directly lead to new sales if you’re doing it the right way. Searching keywords around you can help you find potential customers. Say you run a bike shop. On social media, you do a quick search and see there’s a person near you complaining about a broken bike. If you respond to them and give them an incentive to come in, you just won yourself some business. Positive and negative feedback are both valuable. Don’t be discouraged when you stumble across poor feedback. Take negative feedback constructively and to improve service. If a customer is reaching out through social, that means they haven’t given up on your brand yet; but they want their problem solved. If you can do that, you probably still have your customer. Who’s organically sharing good news about your brand? Do they have a good following? If so, they are primed to become an influencer! Reach out and reward them. Build the relationship. They can be a great business funnel for years to come. What are your customers go-to sites for social media? Are you a craft brewery? You probably want to listen on Instagram more. Small business? Twitter’s a good option. Finding where your target audience lives allows you to reach out to the right people on the right platform. Once Carter cemented his Twitter-fame, he wanted to use his platform to make a difference. When he was younger, his mother was diagnosed with Stage III Breast Cancer and was fortunate enough to beat the disease. Now, he wants to give back. Wilkerson is teaming up with Wendy’s to sell t-shirts on his site. All proceeds go to the Dave Thomas Foundation for Adoption which helps match children with their loving forever families. But, if you’ve got one too many t-shirts in your closet, Wilkerson also requests that you send a donation directly to Pinocchio’s Moms on the Run. The organization provides support systems to women with breast cancer and their families, which is awesome. Plus, don’t forget the original challenge. Hop on Twitter and retweet his tweet to get him to that magic number: 18 million. After all, “A MAN NEEDS HIS NUGGS”. How's your social media game? We're an inbound marketing shop with years of experience driving social media engagement and following. Give us a call today.